NVIDIA Quadro P4000—The World’s Most Powerful Single Slot Professional Graphics Card. The new NVIDIA VR Ready Quadro P4000 combines a 1792 CUDA Core Pascal GPU, large 8GB GDDR5 memory and advanced display technologies to deliver the performance and features that are required by demanding professional applications. The ability to create an expansive visual workspace of up to four 5K displays (5120 x 2880 at 60Hz) with HDR color support lets you view your creations in stunning detail. The P4000 is specially designed with the performance that is necessary to drive immersive VR environments. Additionally, you can create massive digital signage solutions by connecting multiple P4000s via Quadro Sync II. Designs become more complex over time. Visual effects grow in size, complexity, and scope. Scientific visualization and compute problems continue to push the boundaries of workstation capabilities. VR is changing all facets of entertainment, design, engineering, architecture, and medicine. As professional workflows grow in size and complexity, the demand for visual compute power grows with it. 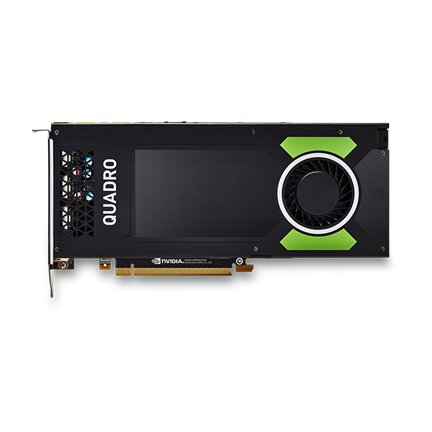 The new Quadro P4000 combines the latest GPU architecture and display technologies to deliver the best performance and features available in a single slot professional graphics card solution. The P4000 enables users to create large, complex designs, render detailed photo realistic imagery, and create detailed, lifelike VR experiences. Designers and engineers can create models with larger assemblies and larger numbers of components, render with higher image quality, or resolution. Quadro P4000 supports multiple displays at up to 5K resolution. Use real-world physics, lighting, and materials during interactive design and visualize with photo-realistic image quality. Integrate simulation during design with finer time-steps, more depth of field, larger assemblies, and more detail in components. NVIDIA Iray® plug-ins enable designers to visualize designs with photorealistic image quality using physically based lights and materials as an integrated part of their workflow. Combine multiple P4000 cards to provide incredible rendering power for larger, more demanding rendering workloads. Pascal’s simultaneous multi-projection feature brings VR-based virtual prototyping to the next level. Larger, more complex designs can be experienced at scale, complete with virtual audio and touch integration. Editors can work in real time with HDR content and up to 8K full resolution on more complex projects with more layers and effects. Animators can create complex simulations and interactive visual effects. This includes building larger scenes with greater numbers of 3D elements—all fitting in graphics memory. 3D texture painting artists can enjoy more creative flexibility in their workflow by keeping a large number of textures and assets in graphics memory. Visual effects artists can create the more complex special effects, maintaining a large number of assets in graphics memory and streamlining the effects workflow. GPU-powered rendering lets artists visualize creations with photorealistic image quality using application-based, GPU-accelerated rendering or with NVIDIA Iray plug-ins using physically based lights and materials. Quadro P4000 brings new levels of VR content-creation power in a single-slot form factor, for more complex, detailed, and lifelike VR experiences. Architects can create complex models—including designing, conducting analysis, and making detailed walkthroughs of structures with greater levels of realism. Plant designers can create complex plant designs and conduct verifications and walkthroughs. Urban designers can create large models with more detail and complexity. Powered by the P4000, VR-enabled walkthroughs allow customers to experience buildings at scale, providing instant feedback on designs, colors, textures, and features, and reducing costly rework once construction has begun. Drive more complex, lifelike HMD-based VR experiences by taking advantage of the P4000’s VR-specific GPU hardware. Synchronize the output of multiple P4000s with Quadro Sync II to create massive multi-display solutions. NVIDIA MOSAIC technology, combined with the P4000, enables seamless multi-projector implementations. The P4000 features 8 GB of GDDR5 memory to enable realistic simulations covering large geographic areas with greater detail. Connect multiple displays or projectors to create 360° field of view. Based on state-of-the-art 16nm FinFET Plus process technology to pack over 7 billion transistors and 1792 CUDA cores and up to 5.3 TFLOPs1 of single precision compute power. The Quadro P4000 graphics board is the industry’s most dominant single-slot form factor graphics board, which is for computationally demanding design visualization or immersive design reviews. Get real interactive experience with today’s demanding professional workflows. Complete stereo rendering of geometry in a single pass to double the effective throughput for applications such as VR. First ever pixel level preemption provides more granular control to better support time-sensitive tasks such as VR motion tracking. Preemption at the thread and instruction level provides finer grain control over compute tasks. Synchronize the display and image output of up to 32 displays from 8 GPUs (connected through two Sync II boards) in a single workstation, reducing the number of machines needed to create an advanced video visualization environment. Each frame lock cable is designed with a self-locking retention mechanism to secure its connection with the frame lock connector to provide robust connectivity and maximum productivity. P4000 + Quadro Sync II turnkey bundles are available. NVIDIA GPU Boost (automatically improves GPU engine throughput to maximize application performance. HBSLIBRIDGE-2W2S-KIT / HBSLIBRIDGE-2W3S-KIT NVIDIA SLI HB Technology Kit leverages multiple GPUs to dynamically scale graphics performance, enhance image quality, expand display real estate. Order PNY Part Number HBSLIBRIDGE-2W2S-KIT or HBSLIBRIDGE-2W3S-KIT depending on motherboard PCIe slot spacing. DP-HDMI-FOUR-PCK Connect the Quadro P4000 to HDMI displays at resolutions up to 4K with PNY Part Number DP-HDMI-FOUR-PCK. The four included DisplayPort to HDMI adapters are recommended by NVIDIA, provide outstanding image quality, and are built to professional standards. DP-HDMI-SINGLE-PCK Connect the Quadro P4000 to an HDMI display at resolutions up to 4K with PNY Part Number DP-HDMI-SINGLE-PCK. The included DisplayPort to HDMI adapter is recommended by NVIDIA, provides outstanding image quality, and is built to professional standards. DP-DVI-QUADKIT-PB Connect the Quadro P4000 to DVI-D SL displays at resolutions up to 1920 x 1200 with PNY Part Number DP-DVI-QUADKIT-PB. The four included DisplayPort to DVI-D SL adapters are recommended by NVIDIA, provide outstanding image quality, and are built to professional standards. DP-VGA-QUADKIT-PB Connect the Quadro P4000 to DVI-D SL displays at resolutions up to 2048 x 1536 with PNY Part Number DP-VGA-QUADKIT-PB. The four included DisplayPort to VGA adapters are recommended by NVIDIA, provide outstanding image quality, and are built to professional standards.